Is your organization primed to engage the biggest generation in history as donors? Millennial donor engagement is critical for every organization that longs to make a lasting impact. The largest generation in history contains your future donors, volunteers, and ambassadors. Simply put, Millennials are the future of your organization. So translate our groundbreaking research on Millennial giving into action. 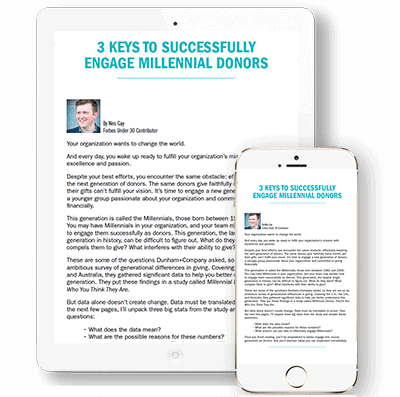 Download your free ‘3 Keys to Successfully Engage Millennial Donors’ white paper today!